A generalist species is able to thrive in a wide variety of environmental conditions and can make use of a variety of different resources (for example, a heterotroph with a varied diet). A specialist species can thrive only in a narrow range of environmental conditions or has a limited diet. Most organisms do not all fit neatly into either group, however. Some species are highly specialized (the most extreme case being monophagy), others less so, and some can tolerate many different environments. In other words, there is a continuum from highly-specialized to broadly-generalist species. 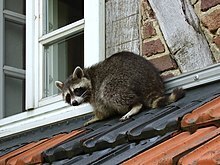 Generalists such as raccoons are sometimes able to adapt to urban environments. Omnivores are usually generalists. Herbivores are often specialists, but those that eat a variety of plants may be considered generalists. A well-known example of a specialist animal is the koala, which subsists almost entirely on eucalyptus leaves. The raccoon is a generalist because it has a natural range that includes most of North and Central America, and it is omnivorous, eating berries, insects, butterflies (Hackberry Emperor, for example), eggs and small animals. Monophagous organisms feed exclusively, or nearly so, on a single other species. The distinction between generalists and specialists is not limited to animals. For example, some plants require a narrow range of temperatures, soil conditions and precipitation to survive while others can tolerate a broader range of conditions. A cactus could be considered a specialist species. It will die during winters at high latitudes or if it receives too much water. When body weight is controlled for, specialist feeders such as insectivores and frugivores have larger home ranges than generalists like some folivores (leaf eaters). Because their food source is less abundant, they need a bigger area for foraging. An example comes from the research of Tim Clutton-Brock, who found that the black and white colobus, a folivore generalist, needs a home range of only 15ha. On the other hand, the more specialized red colobus monkey has a home range of 70 ha, which it requires to find patchy shoots, flowers and fruit. When environmental conditions change, generalists are able to adapt, but specialists tend to fall victim to extinction much more easily. For example, if a species of fish were to go extinct, any specialist parasites would also face extinction. On the other hand, a species with a highly specialized ecological niche is more effective at competing with other organisms. For example, a fish and its parasites are in an evolutionary arms race, a form of co-evolution, in which the fish constantly develops defenses against the parasite, while the parasite in turn evolves adaptations to cope with the specific defenses of its host. This tends to drive the speciation of more specialized species provided conditions remain relatively stable. This involves niche partitioning as new species are formed, and biodiversity is increased. ^ Krebs, J. R.; Davies, N. B. (1993). An Introduction to Behavioural Ecology. Wiley-Blackwell. ISBN 0-632-03546-3. ^ Clutton-Brock, T.H. (1975). "Feeding behaviour of red colobus and black and white colobus in East Africa". Folia Primatologica. 23 (3): 165–207. doi:10.1159/000155671. PMID 805763.